If you’re reading this, chances are you love travelling and you don’t really like or even hate visiting those popular tourist attractions that everybody can find in the traditional travel books, let alone following that characterless tourist tour around town. If this is you and you are planning your next trip to London, you’ll love it here. London is a fascinating city with a lot to see. If you are visiting for the first time you’ll want to stop by Big Ben, Westminster Abbey, London Eye, the Tower of London and Tower Bridge, Buckingham Palace, St. Paul’s Cathedral… take the cliché picture and move on to the next stop. That’s alright, we have all done that at least once. After that you’ll need some more research and imagination to keep you going, right? Good thing is London is much more than that with tonnes of things to do and experience. One of our favourite things to do when in the English capital is to walk around with our cameras and scout for street art. That’s something that can be done spontaneously or at least you’ll need no planning ahead after reading this post. Just bear with us! In our last trip to London we heard of Brick Lane, an area in East London not far from Spitalfields Market. Brick Lane is one of the ethnic and artistic hip centres in London and also well known for being the heart of the Bangladeshi zone of the city. Does it sound familiar? No? Well, what if I tell you that the area of Brick Lane was once the morbid hunting grounds of the infamous Jack the Ripper? I guess I got your attention now right? But don’t worry, the only vivid red you will see in this post will be in the art pieces you’re about to see. We took all these pictures ourselves during a 2 hour stroll along White Church Lane, Osborn St, Brick Lane and up to the north to Shoreditch High Street train Station. This itinerary put together by the guys at Inspiring City will help you navigate the area and see these and other beauties. You basically start at Aldgate East underground station and walk East till you find the south end of Osborn St. At this point the fun starts! If that wasn’t enough for you, a short underground ride will take you to Camden Town. Immediately after leaving the underground station, start walking along Camden High St. towards Camden Lock Market. You’ll start noticing unusual decorations on the facades of the upper floors and wall paintings all around. 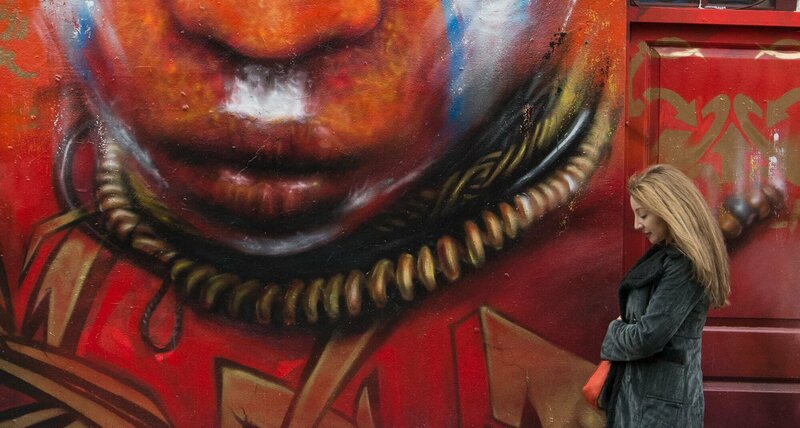 Again, Inspiring City has an itinerary for you around the street art scene in Camden Town. The best thing of street art, and probably the worst of it if you’re following a fixed itinerary, is that it’s ever changing. Old pieces fade with time and new ones appear periodically. So don’t be surprised to miss a piece and keep your eyes peeled not to miss new jewels in these areas or even in Brixton, Hackney and Shoreditch to name just a few other districts. Also, you’ll find that many of the paintings are displayed on rolling doors of shops and restaurants. That means you’ll not see them during business hours when the doors are up so you might have to wait or visit again at a more appropriate time. Stay tuned! We will talk about more of our favourite not-so-touristy London pearls in a new post soon! Do you enjoy the traditional way of visiting a city or do you rather go off the beaten track? What is your favourite alternative location, restaurant, area,… in London? Share your thoughts with us and we’ll feature you in our next post! Long weekend in London: friends, shows, shops, views and eats. 6 Comments on “Scouting For Street Art In London”. Join the Conversation Here! Great suggestions. I love finding unique gems to visit in a new city. Thanks for these ideas! You’re very welcome Shari. We love getting lost in a new city hoping we will come across surprises like this, it’s one of the reasons why we travel! Hi Joe, thanks for dropping by. I wish I would live in London to explore more districts with gems like this, I find them fascinating and are a great photography topic! No trips planned anytime soon – but will keep it in mind for my next trip!